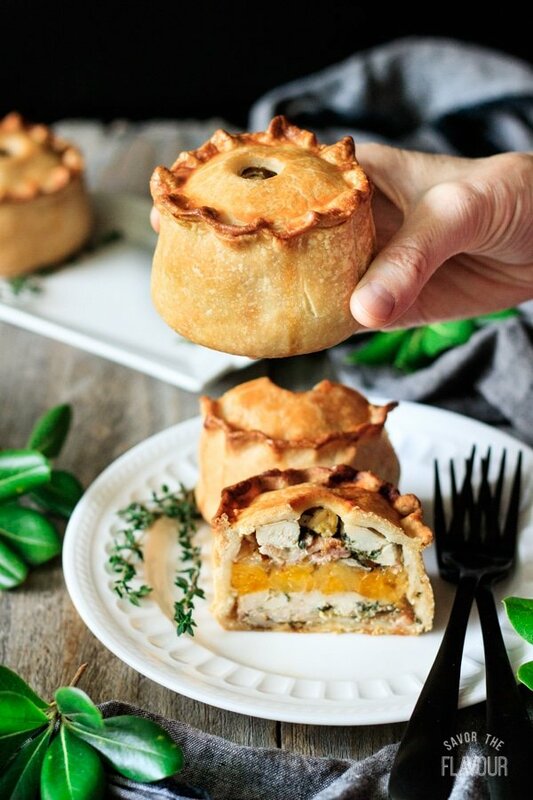 The flavorful layers of meat, onions, and dried apricots make these individual British pies something you’ll want to try. Learn how to make them from scratch for your next special dinner! 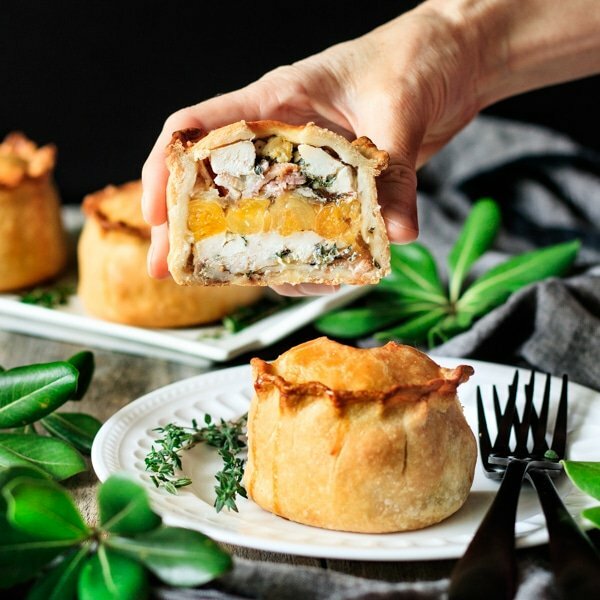 Individual meat pies are a joy to eat, especially when they’re as cute as these chicken, bacon, and apricot pies. 😋🍗 The crisp, golden hot water crust pastry encloses a flavorful layered filling. Making these pies from scratch takes a little love, but it’s so worth it. 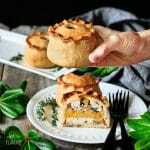 Can I freeze the hot water crust pastry? Once the pastry is baked, it can be frozen. 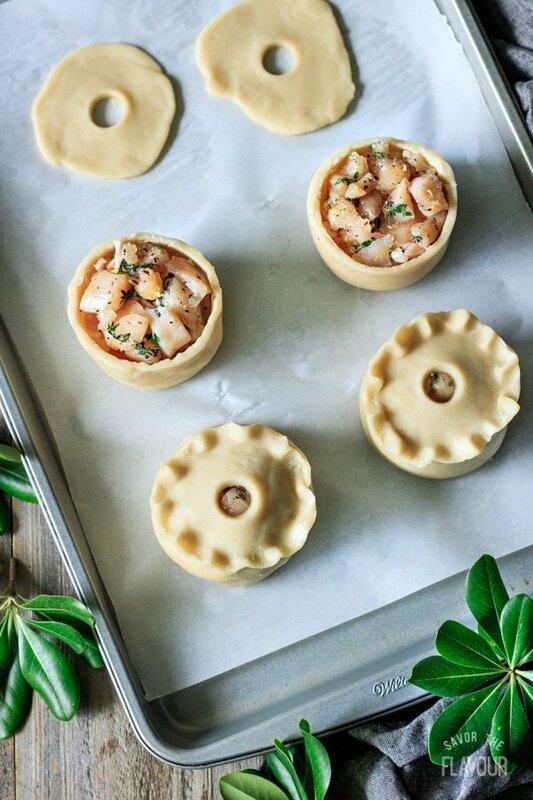 Uncooked hot water crust pastry can’t be frozen, since it needs to be warm when it’s shaped. Roll out some hot water crust pastry to a 7-inch circle. Wrap the pastry around a lightly oiled jam jar. Flatten out the wrinkles, then lay the jar on its side and roll it back and forth until the pastry is smooth. Make holes in the lids with a piping nozzle so you can pour in the chicken stock jelly later. Chill the pastry for 20 minutes, then trim off the excess to give the pies an even rim. Doing one jar at a time, fill the jar with boiling water, then loosen the pastry with a knife and pull out the jar. Layer the filling inside as follows: bacon, onion, chicken, apricot, bacon, onion, chicken. Brush the rim of the pie with beaten egg, then place the lid on top and gently pinch to seal. Crimp the edges to get a ruffled look. Remember to brush the lids with beaten egg to make the pies golden brown as they bake! Bake at 400 F for about 50 minutes, until golden brown. Pour in the chicken stock jelly while the pies are hot, then let them cool. Refrigerate the pies for 8 hours to allow the jelly to set inside. Slice the pies in half, and serve. You and your family will enjoy these special pies for dinner! 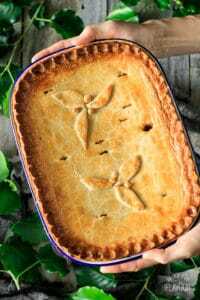 When you’re shaping the pies, make sure the hot water crust pastry is still warm, since it hardens and becomes brittle once it’s cooled. Keep the pastry warm in a double boiler if you can’t use it right away. Cover the pastry with aluminum foil while baking if it’s getting too dark. 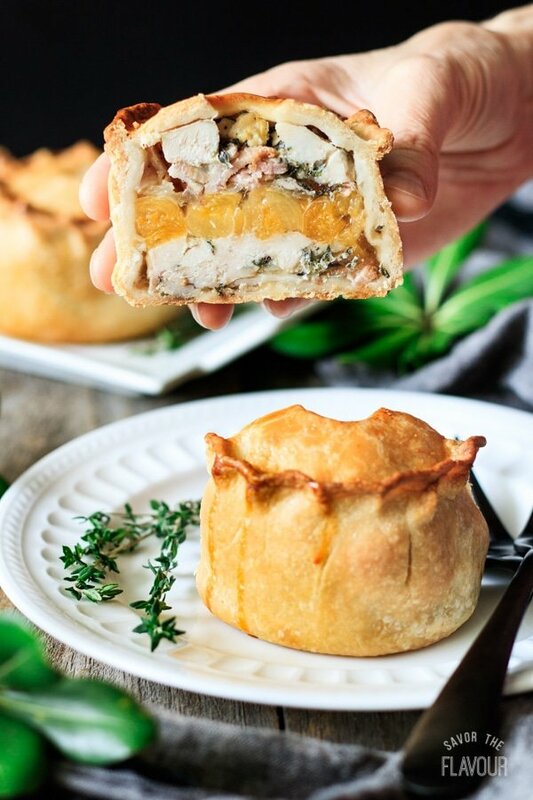 Although the jelly is optional, I recommend it because it keeps the filling moist, fills in the gaps inside the pies, and adds even more lovely chicken flavor. If you do use the jelly, it’s not recommended to warm up the pies, as this will melt the jelly. Leftover jelly can be poured into a bowl and chilled until set, then served with the pies. Cook any leftover filling over medium heat until the chicken and bacon are cooked. Add a couple splashes of white cooking wine, then cook for a couple more minutes to evaporate the alcohol. Since these pies keep very well in the fridge for a few days, I recommend making them the day before. These other hearty meat pies will have you coming back for more. 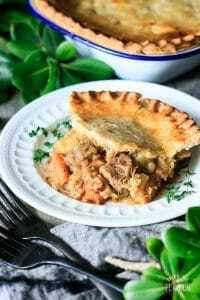 Chunky Beef and Potato Pie: a hearty, flavorful beef stew baked under beautiful golden pastry. How to Make Irish Dingle Pie: use up leftover roasted lamb in this delicious main course. 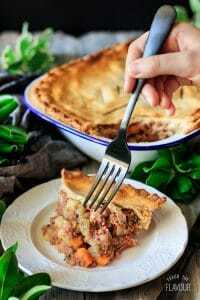 Old Fashioned Corned Beef Pie: this veggie-packed pie has its roots in WWII rations. 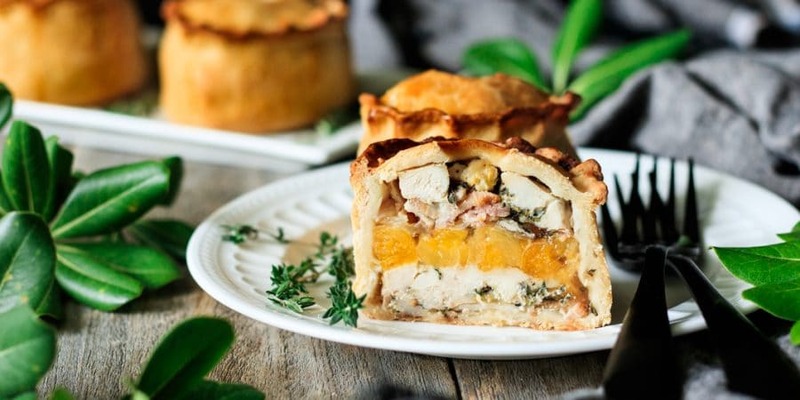 Share your thoughts on this chicken, bacon, and apricot pie by leaving a recipe review below. We’d love to hear from you! Cube the dried apricots and chop the onion. Rinse and pat dry the thyme, then pull off the leaves until you have 1/4 cup (6g) of leaves. Grate the lemon zest and measure out the salt and pepper. Cut the bacon slices into small pieces, then cube the chicken in small chunks. Place the meat in separate bowls, cover, and refrigerate until needed. Line a 9 by 13-inch rimmed cookie sheet with parchment paper, then very lightly oil the outsides of four clean 6-ounce (177 ml) glass canning jars. Divide the still warm hot water crust pastry into four equal pieces. Cut a small chunk off each piece and set aside to make the lids for the pies. 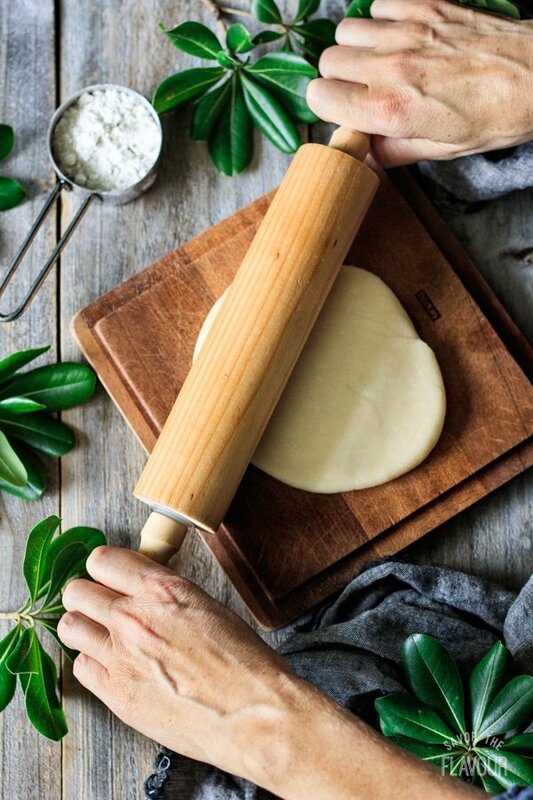 Roll out one of the larger pieces of pastry to make a 6 or 7 inch circle. Place the jar in the center of the circle and bring the pastry up around its sides. 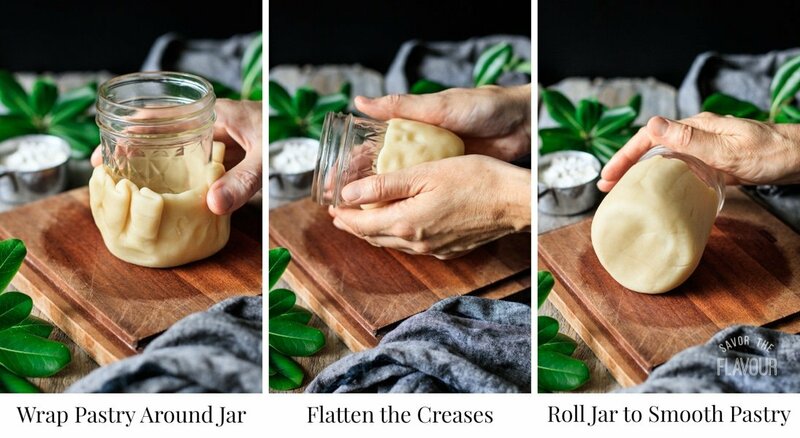 Flatten out the creases with your hands, then lay the jar on its side and roll it back and forth to smooth out the pastry. Try not to make the pastry too thick, but make sure there are no holes. Repeat with the remaining jars. 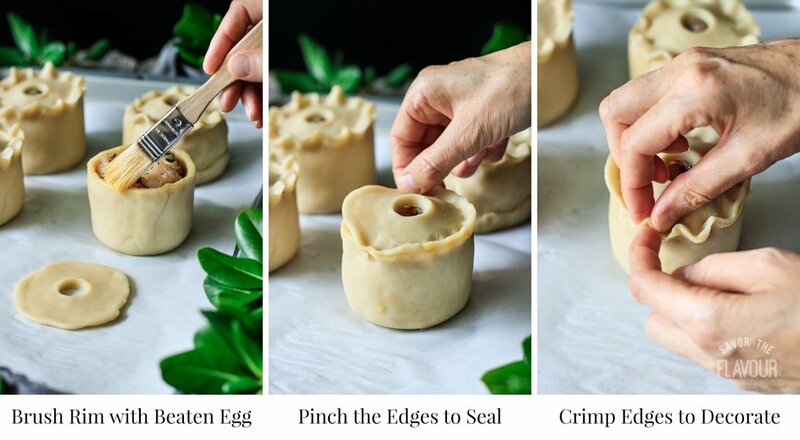 Roll the four smaller pieces of pastry into circles a little larger than the mouths of the jars, then cut a 1/2 inch hole in the center with a piping nozzle. This will allow you to pour in the stock later. 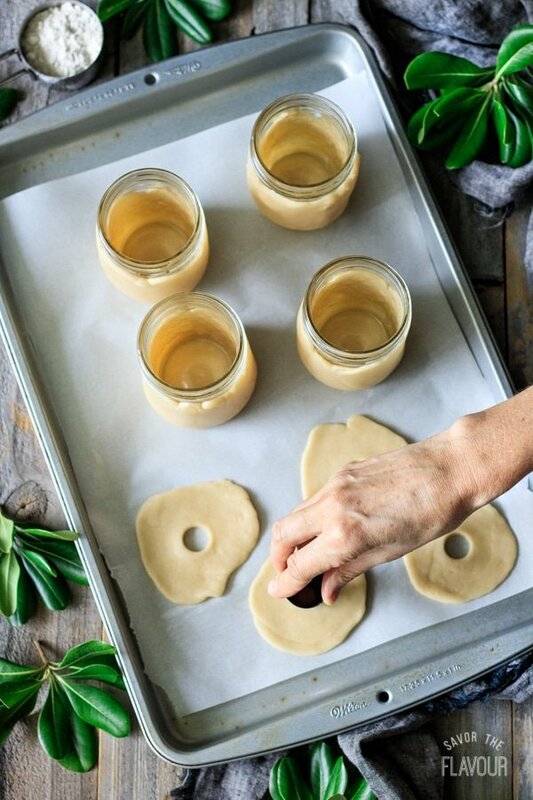 Chill the pastry-wrapped jars and lids for 20 minutes. Meanwhile, fill a kettle with water and bring to a boil. Once the pastry has chilled, trim off the excess pastry to give each pie a flat top. Fill one of the jars with boiling water, then gently loosen the pastry with a knife and carefully pull the jar out of the pastry. Repeat with the remaining jars. 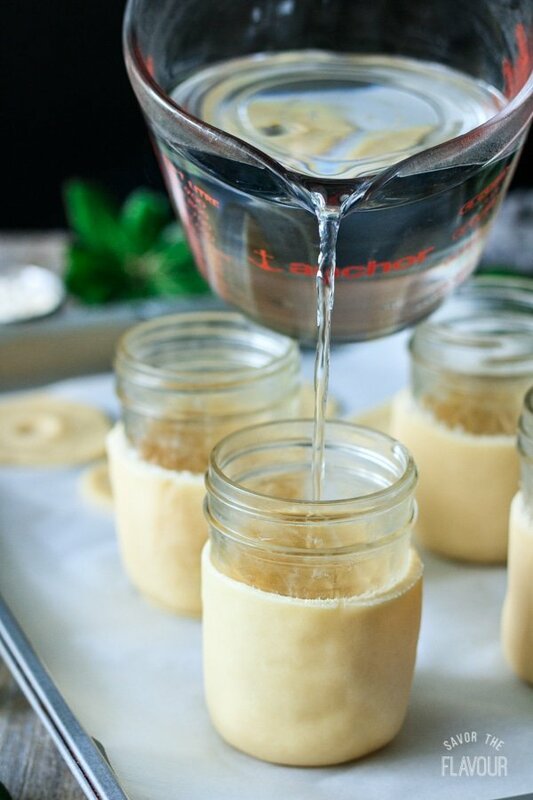 Be careful not to let the hot water sit in the pastry-wrapped jars for long, or the pastry will become very soft. Toss the chicken with the lemon zest and half of the thyme, salt, and pepper. Add the remaining seasonings to the bacon and mix until well blended. Layer the filling in each pie as follows: bacon, onion, chicken, apricot, bacon, onion, chicken. Make sure the filling goes all the way to the edges of the pie, and be careful not to overstuff. You will probably have extra filling. 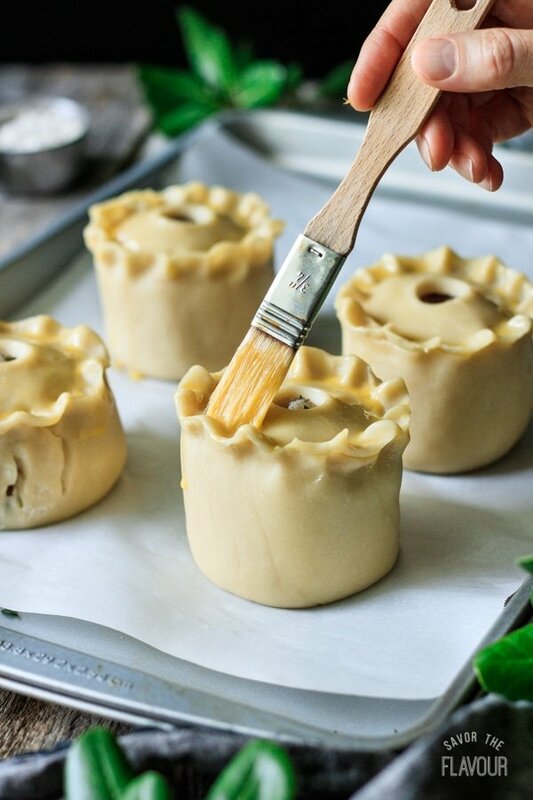 Brush the rims of the pies with beaten egg, then place the pastry lid on top. Pinch the edges gently to seal. Decoratively crimp the edges by placing your thumb and index finger on top of the edge about 1/2 inch apart. Push the index finger of your other hand in between the gap to make a bump. Repeat all the way around each pie to create a ruffled edge. Brush the tops of the pies with beaten egg. It’s okay if the egg drips down the sides. Bake the pies at 400 F for 50 minutes, until the pastry is a rich golden brown and the pies have an internal temperature of at least 170 F. Place the pies on a wire rack and let them cool for 10 minutes. If you’re not adding the chicken stock/gelatin mixture, skip the next steps and serve them warm or cold. Heat the chicken stock in a small saucepan over medium heat until quite warm. Meanwhile, sprinkle the unflavored gelatin over 1/4 cup cold water and mix to combine. Let stand for 5 minutes, then add to the warm stock and stir until dissolved. 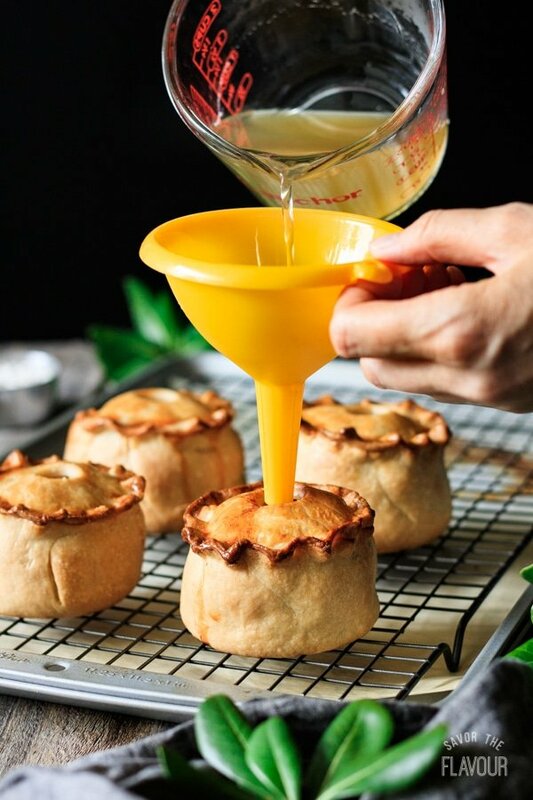 After the pies have cooled for 10 minutes, pour the stock into the hot pies with a funnel until each pie is full to the top. The filling will absorb the stock, so check them in a minute or two and continue to add the stock until the pies are full. Let the pies cool on the counter for a couple hours, then cover and refrigerate for 8 hours to allow the jellied stock to set. Serve the pies cold and cut in half. These pies keep very well in the fridge for a few days. I have never made a meat pie. Does the meat get cooked first? For this recipe, the chicken and bacon goes in raw. The pies get very hot inside–almost like a mini oven–and cooks the meat beautifully. For most other savory pies, however, the meat is cooked before the pie is baked. If you leave out the jelly can these be served hot? Of course–you can leave out the jelly and serve the pies hot. I actually like to serve the pies warm, too; the heat brings out the flavors! There seems to be a lot of thyme. Is this correct?